I have dated this bus by its registration and as KLB started being used in July 1949 so I thought it was a fairly safe guess. I have also stated that its original body was buy Saunders who built a batch of 250 RTs fleet numbers RT1152-1401 between 1948-50. After the war AEC produced RT chassis quicker than Park Royal and Weymann who were the allocated body builders could supply bodies so two other companies Saunders Engineering, Anglesey, Wales and Craven, Sheffield, Yorkshire were used to prevent a backlog. I recently acquired a copy of ‘British Bus Fleets’ London Transport 1965 edition and I thought you may be interested in the opening comment about the RT bodywork I quote below. So it would be fairly safe to say that the bus above as a different body when this photograph was taken than when it was first delivered, another little bit of evidence is that when it was first delivered it had a roof top route number box. RT bodies were jig built so that they could be interchanged – the jigs supplied by London Transport to Park Royal and Weymann, the major suppliers. Metro-Cammell also received jigs and I believe Saunders-Roe did. Metro-Cammell and Weymann were entirely separate companies linked only by a marketing company MCW, rather like the milk marketing board. There were always minor differences between the products of each factory. Cravens bodies were not jig built and were not really like the rest of the RT family. After their seven year certificate if fitness was up, they were disposed of as non-standard, as were the Saunders-Roe RTs whose construction was non-standard. The Saunders-Roe RT’s were difficult to distinguish from ‘normal RT’s, perhaps because they borrowed an RT to design their own bodywork from scratch, but the Craven’s ones were the Standard Craven bodyframe ‘tweaked’ to look as near to an RT as was possible. However, for a start, the bodywork had five bays instead of four; the rear of the bus, from about midway upwards, curved towards the front, making it look hunchbacked, and the rear emergency window was smaller. The front profile was subtly different, flatter horizontally than was usual. The fronts were an improvement on the normal design, the rear not, the sides neutral. This was not the first case of ‘tweaking’ bodywork for London Transport’s needs: Leyland ‘tweaked’ their TD4 bodies (pre-war STD class) to look like an STL and, to the layman, it did. I don’t know who might have taken this shot, but it was probably after 1949. The clue is the bus stops, which in 1949 Victoria still sported the LPTB design, which in turn was from the General stops with the bar circle and route numbers in large type. The Saunders-Roe bodies were instantly recognisable from the offside by one little detail – the route number stencil was set further to the rear of the staircase panel than on the standard bodies. Personally I thought that the Cravens bodies were extremely pleasing in their own right and always liked them very much – quite a number were sold to Dundee Corporation, among many other operators, for further service. The postwar STD class, all Leyland PD1s, were very minimally "tweaked" and were a fine sight in London Transport livery and even retained hinged cab doors. Splendid indeed though the standardised RT family concept was, the exceptions were a fascinating subject, and we mustn’t forget the unhappy SRTs which I also found very appealing indeed, although their vast differences were largely mechanical rather than in body detail. This photo was most probably taken in the mid-1960s – confirmed by the presence of the Routemasters and the advert for a BOAC flight to New York by VC10 in the background. Those were the days! The original Saunders body had a front roof route number box, whereas the body shown in the photo does not. The bus in the photograph has either a Park Royal or Weymann body, received on overhaul in July 1961. So the photo must have been taken after July 1961. Before 1964 the Route Blinds consisted of upper-case lettering. The photo clearly shows lower-case lettering. So the photo must have been taken during or after 1964. Bus Route 52A was operated by Edgware garage. RT1344 was transferred into Edgware in January 1963. It remained there until 1969 before spending a few years as a trainer. So the photo must have been taken at some date between 1964 and 1969. Bus Route 52A was only operated (in this form) from 23rd January 1966 to 31st December 1966. So the photo must have been taken at some date in 1966. Furthermore, Route 52A (in this form) only operated on Sundays ! (six RT’s from Edgware and seven Routemasters from Willesden) The bus was scrapped in May 1971. I hope that the above is of interest ! Further to my previous comment, this photo was taken at Victoria Bus Terminus outside the (then) Southern Region British Rail station. I lived in Borehamwood until 1963, I am sure I travelled this route (52A rather than 52), during my ‘bus spotting days’, with the Ian Allen books, whilst using a Red Rover ticket. I lived not more than 200 metres from the route in Manor Way. I know the route 52 was one I used many times to finally get home after a day uptown spotting. I have a builders plate from an RT which was given to me by my brother-in-law back in the late 60s early 70s, it is the normal Weymanns plate fitted over the conductors station on the platform, he was a driver at Watford garage and "acquired" it for me as I was also a driver for Bristol Omnibus Company in Bristol and a keen transport fan. What I am wondering is, can you give a rough estimate of the vehicle it came from? The series of patent numbers on the plate are as follows, 447826, 498947, PROV.8954/49. It may be a ridiculous hope, but you never know, thanking you in anticipation. The mentioning of the non standard RTs reminds me that J J Longstaff of Mirfield had at different times two Saunders and one of them had a top box. The joint service between Dewsbury and Mirfield operated by themselves and Joseph Wood and Yorkshire Woollen was numbered at least by YWD as service 11 so number 11 appeared in the box only for YWD to complain that it was their number so was hurriedly painted out. Like the vast majority of London buses since General days, this RT not only has a different body it also has a different chassis. The system pertained until about 1983 after which it was discontinued when vehicle testing was re-(dis)organised by the Thatcher government. Looking closely at the photo of RT 1344 at Victoria I spy that the 52A route number is being displayed. 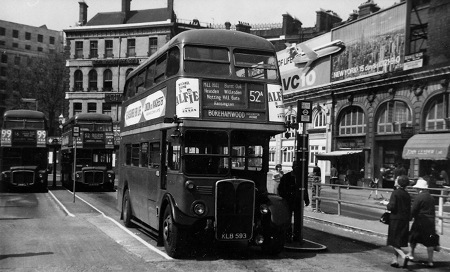 At the time of the photo, RT 1344 was allocated to Edgware and I drove it on a number of occasions. The photo must have been taken on a Sunday as EW only worked on the route on that day and the 52A blind is incorrect as the route ceased to exist after 2nd January 1962 when it was superseded by the 292. That was the day that Colindale trolleybus depot closed and we were transferred to various bus garages such as Hendon, Crcklewood and Edgware. The 52A route number was still on the EW blinds up until they were withdrawn from the garage in 1971.